It's one thing to stumble upon one cool old car. It's quite another to fall into an unheralded cache from the personal collection of Carroll Shelby. CarGuyDad's Kamil Kaluski explains. — Ed. While driving around Boulder, Colo., my wife noticed a sign that said "Car Museum." Thinking that it was just another collection of random cars, I did not make much of it. When we arrived at the art museum we were going to, I inquired about the car museum and was informed that "The Shelby Museum is open only on Saturdays until 4pm"… [moment of silence]… "Excuse me? Shelby? As in Carroll Shelby?" I asked while looking at my watch, which indicated 3:27pm. On a Saturday. Five minutes later, to the protest of our daughter, we arrived at a very nondescript warehouse building. So nondescript in fact, that we drove by it three times without noticing it; the only clue to the museum was a small banner on the building. Thankfully all that changed once we stepped inside. Where I was expecting perhaps one or two cars and some memorabilia, I was greeted by dozens of Shelby vehicles of various vintage and models. In total there were approximately forty cars on display, predominately Cobras. 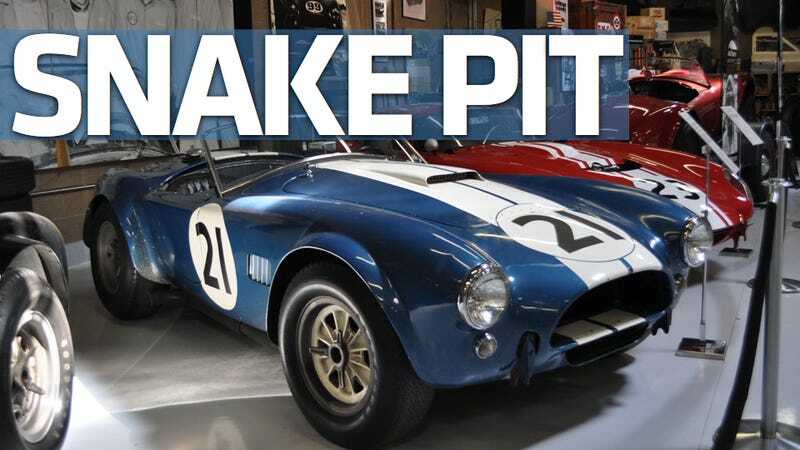 From the early British AC Cobras, prototypes, to street 427s, to historic race cars, all were present. 1960s Mustangs were also in abundance, including the King Road. Several GT40s, one of which included a black 1966 LeMans racer. Other rare cars included a race Ferrari that was driven by Carroll and Phil Hill (amongst other drivers) and Pete Brock's Falcon wagon with a bunch Shelby bits on it, including a healthy race-spec 289. The Falcon was the company's parts getter and tow vehicle, and to me the most interesting vehicle there. Also present was one red Daytona Coupe. The areas surrounding the cars were filled with parts such as wheels and body panels. There was also the DOHC V8 Indy engine with exhaust manifolds coming out of the middle of the V. More Shelby performance parts and body parts were attached to the walls… I think I could built my own GT40 out of them. The rest of space was filled with automotive memorabilia and a bar. Due to my limited time of twenty minutes I was not able to do more than get some pictures. I briefly chatted with the museum patron about some of the cars but in the end I have no idea why a Texan whose company headquarters are in Las Vegas would have a museum in Boulder. Check out the museum's website where you will find the details on the collection. If you happen to find yourself in the Denver/Boulder area this museum is not to be missed. This story originally appeared on CarGuyDad on April 28, 2011, and was republished with permission.